Dorothy A. Burke 91, of West Winfield passed away peacefully on Friday February 8, 2019 at Little Falls Hospital surrounded by her family. She was born on January 4, 1928, in West Winfield, a daughter of the late Donald B. and Charlotte (MacHeffey) Yaw. She graduated from West Winfield Central School in 1946. After graduating hichschool Dottie earned her AAS in Textile Technology at MVCC, then went on to work at a textile mill in Amsterdam, NY before marrying Morrell L. Burke of Cedarville, NY in 1950 and remained married nearly 66 years. (Mr. Burke passed away on July 17, 2016.) She and her husband owned and operated Burkestead Farms, in East Winfield throughout the 60s and 70s. 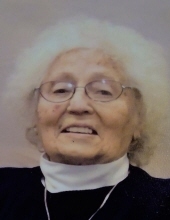 She was a member of the Cedarville Church, a certified 50 Year member of the Daughters of the American Revolution as well as Herkimer County 4H leader for many years. In addition to the crafting and animal care skills that she passed on to her own children and dozens of 4H members; she enjoyed Hunting, Taxidermy, Knitting and Crocheting. She is survived by her children, Daniel (Nancy) Burke, Thomas (Shelly) Burke, Edith Burke, Patty (Lee) Seifried, Jan Burke, Jon (Dawn) Burke. She also leaves 11 grandchildren, and eight great-grandchildren. She leaves two step great-grandchildren, her sisters, Jayne Donelan, Marjorie (Robert) Pett, and was predeceased by Sisters Rebecca Mosher, Joanne Decker-Flood, and brothers, C. James Yaw, and William Yaw. Family and friends are invited to attend a Memorial Service on Saturday February 16, 2019 at 1:00 PM at the Dimbleby Funeral Homes Inc. 365 West Main St. in West infield. Interment will be in the spring in the East Winfield Cemetery. Family and friends are invited to call two hours prior to the service on Saturday from 11:00 AM to 1:00 PM at the funeral home. To plant a tree in memory of Dorothy A. Burke, please visit our Tribute Store. "Email Address" would like to share the life celebration of Dorothy A. Burke. Click on the "link" to go to share a favorite memory or leave a condolence message for the family.